There's online discernment ministry, and there's online "discernment ministry." I hope I'm the former. The latter is often discussed negatively. When "scare quotes" are put around the name of discernment ministry, it's a pejorative. Scare quotes in journalism are sometimes called sneer quotes, so you get the idea. Though I post articles about a trio of topics, including encouragement and prophecy, I do post articles about discernment. I post articles naming names of false teachers. One-third of what I do online regarding my blog is online discernment. So, am I one of the good ones, or one of the bad ones doing "discernment ministry"? Let's have a two-part lesson on how to do online discernment ministry, and through it I'll reveal what I do and how I go about it, and I'll challenge you to test the discerners you follow, (including me), by sharing how. One of the gifts given to people by the Spirit is discernment. (1 Corinthians 12:10). This is one of the spiritual gifts given to me. I primarily serve in my local church, which I believe is extremely important because it's a command (Ephesians 4:12, Romans 15:2 etc). Spiritual gifts are meant to be used in a local body of believers, for edification and for accountability purposes. Biblically, discernment is important. It's a skill all believers must hone, but some were given 'an extra dose' if you will, in the form of a specific gift. In the days when the canon was not set, prophecies and revelations and epistles were coming in to the believers. Some of the letters were false. Each local body needed to be able to determine which messages were truly from a designated apostle, and which were false. The church at Ephesus was praised for having developed worthy discernment, (Revelation 2:2) while the church at Thyatira was rebuked for their lack of it. (Revelation 2:20). By 2003, user-friendly blog platforms had come along, and Blogger announced it had a million users. Christians rapidly gravitated to this new publishing method and pastors and theologians were setting up blogs to push the message. So were lay theologians, cranks, wingnuts, and anyone with a theory or opinion, including me. My first blog came along in 2006 but after two and a half years of writing increasingly Christian content, I separated the content and started a second blog, this one, in January 2009. It is solely focused on Christian content while my other one remains personal. I've blogged just about every day on The End Time blog ever since. By now in the new millennium, many other means have been invented with which to share the message of the Gospel and to maintain its purity. Podcasts, websites, blogs, movies, texts, simulcasts, and more are blessedly available to get our message out. I believe those methods should be used. In Paul's day there was no internet. But he wrote letters, the internet of his day. Whatever means that the Lord has allowed to be invented to share Christian doctrine, testimonies, missionary reports, and the like, is a good thing in my opinion. I've published 4,370 essays. That is a lot to say. Yet, who am I? Just some lady in a corner of the internet. I'm not a celebrity. I haven't gone to seminary. I am just someone taking advantage of the platforms available to share my opinion and perspective. You need discernment to ensure that I am worthy of your time and attention. I have been a writer all my life and before the internet was available, it was hard to get published. I had been published a few measly times, in a journal or magazine here or there. But it took enormous effort to send pieces for publication to Publishing Houses or Magazines and the monoliths would send rejection letters back after many weeks, if they sent anything at all. It was frustrating. So when easy platforms like Blogger, LiveJournal (remember them?) and Wordpress came along with the touch of a button, anyone could publish, including me! So I did. An egalitarian publishing world has its downsides too. People can and do propagate error. Not just in theology but in politics, sociology, psychology; in any -ology there will be people who want to push their message. The internet is unregulated, (yay!) but it takes wisdom and discernment to sift through increasingly unhealthy, errant, or just plain rotten content to find the gold. Or just the good. What are the Blogger's Credentials? Track Record? So when you look for a blog to follow, especially a discernment blog or an eschatology blog (those Christian subjects seem to draw the more wonky theorists and unstable theologians), look to see who is writing. Do they have a track record? Do they have credentials? Not that credentials are of sole importance, but sometimes it counts- and that can be for or against. A blogger might say in his 'About,' that "I have a Masters of Religious Education" but upon searching further you discover the MA is from Brigham Young University, the Mormon college. As to the track record, look for their trajectory. Did they start off solid and weaken over time? Do they quote the Bible appropriately? Do they quote the Bible at all? Or are they drifting into theories and conspiracies? Are they focused on secular controversies or extra-biblical prophecies, personal revelations? When I first started blogging I did newspaper eisegesis. I looked at the news and looked at the Bible and then made statements about it. Israel really is the center of it all! There's a reason Israel is always in the news! The Middle East is volatile because of the Esau-Jacob struggle! People really are horrible, not basically good, and the news confirms it! I don't think I ever crossed a line, but you can determine that. I didn't focus solely on that, though, which is another important measure of a credible discernment ministry. If someone is always writing about and researching the bad, that colors one's perspective. Soon one can lose perspective. As for my early days, I don't apologize for the interest in global affairs as they related to biblical prophecy. My eyes had been opened to another world, the Christian worldview through a biblical lens, and it was wonderful and amazing. I loved that time. I remember distinctly the amazement I felt when learning that the Christian world had been there all along. I was aroused with wonder to learn that God's plan is orderly and may come to an end any day. That sense of wonder and imminence has never left me and I hope it never will. But I grew out of the newspaper stuff by the Lord's grace and went on to study deeper theology. That is what to look for. Is a discernment ministry writer growing up toward Christ, or growing away from Christ? My credentials...I am loathe to share lest it seem like boasting, but the few times I've mentioned this in 9 years perhaps will be forgiven. I am a writer & researcher, having been published in The Reading Teacher and The LAB at Brown University, in literary journal Brownstone Review and Glamour Magazine. I have helped edit Chicago’s National Association for the Study of Education 98th and 99th Annual Yearbook of Education Research. I was a newspaper publisher, editing a New England Press Association award-winning weekly newspaper. I've also been employed by the daily paper Athens Banner Herald as a features writer and have written for the Madison County Journal. I was and am a educator. I worked as a short and long term substitute, a para-professional and as a certified elementary school teacher. I took some years off to attain a Masters Degree in Literacy Education, and to travel widely, before resuming work as a para-professional, of which I am employed to this day. Is the Blogger a Lone Ranger, Not a Member of any Church? I am a member of a local church, fully participating by steady attendance at Sunday worship service as well as weekly attendance in several small groups overseen by the church elders. Those are my professional and personal credentials. I have no theological credentials. I have taken several for-credit classes through Ligonier. I listen to The Master's University lecturers online. I applied to and was accepted at Reformed Theological Seminary but after the very first class taught a possible young earth and long years evolution, I quit. Other than daily study in diligence and submission, regular church attendance, and listening multiple times per week to credible pastors, I have no official theological credentials. When you visit a discernment ministry online, assess who is in charge of it. Who is writing and sending out theological messages? I can't tell you to do that without giving you some idea of who I am, and whether I should be read or followed. Transparency is important. Hence the above paragraph. I do not agree with those writers who blog anonymously. I understand the issues around privacy and safety, especially for women, but if one is going to proclaim Christ, one does so openly. Jesus said He did nothing in secret (John 18:20). Paul said he works openly, nothing is done in secret (Acts 26:26). That is the how and the why. Part 2 will discuss how to assess whether someone is a credible online discernment ministries such as discussing the importance of primary sources, and other tips such as separation issues and solidity and growth over time. I'll look at how unscrupulous "discernment bloggers" use tenuous connections, weasel words, out-of-context material and quotes, and unrepresentative doctrine. Till then, thank you and bless you for reading. Appreciated this! LOL, I've got far fewer credentials than you. When it comes to theology, I'm just a sister in the Lord with her Bible and the gift of discernment. Not sure I could claim anything else. Goodness, I remember the "old days" when publishing was restricted to the select few. Nowadays, you're right, anyone can publish anything online, anytime. What a good reminder to be wary of what we read, to ensure the information is legitimate and true. Thanks! I'm sure as we are both lay sisters with an open Bible and a gift of discernment, that you, too, have heard a few lectures and participated in a course or two somewhere. Those are my credentials, and I suspect, most people's, if they are curious and diligent. 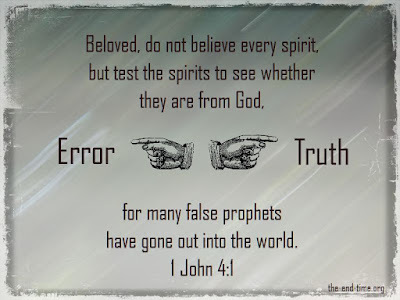 Hi and thanks for the info!There is much going on in the Body of Christ...but we must remember that the Lord always has his remnant!Also we must remember that those who don't believe in prophets and prophetess should realize that to have false ones...you first must have real ones! It's always good to remember that the Lord has His remnant in eveyr era! 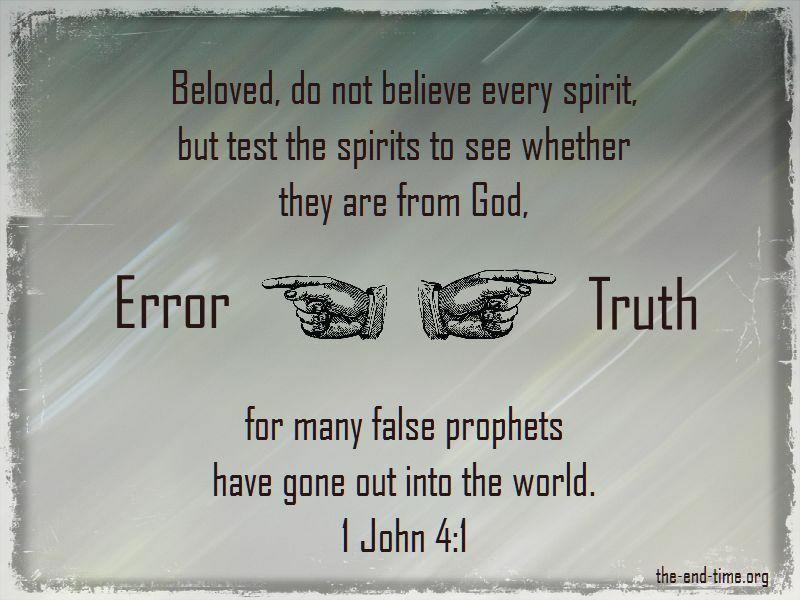 I'm not sure I understand your last sentence- "we must remember that those who don't believe in prophets and prophetess should realize that to have false ones...you first must have real ones!" Can you help me understand, show me scripture that explains It? Thanks! The gifts in I Cor. 12 are supernatural gifts. The gift of discerning of spirits is not the same as discernment, which is not a gift at all. Discerning of spirits is supernaturally being able to tell when or if a particular spirit is operating, for example, in an illness. Discernment is something every believer can have if he or she compares what is being taught to what the Bible teaches. Unfortunately, few study the Word enough to know when preachers and teachers are false. And some may recognize the false teaching, but refuse to call it out. Hi. I have just come across your blog today. I have been a Christian for 36 years and am looking forward to reading your articles. I am feeling a little overwhelmed lately by the amount of false doctrinal teaching going on...I am having to sift through everything I have listened to over these years...I always prayed for discernment and consider myself an "educated" person with a degree and other qualifications, but I find I have been misled by many...oh dear. So just to say I appreciate all the work that you have done. Thank you for your comment and your readership. I am saddened by the amount of false teaching as well. But We began studying John 1 today at church and it's always great to remember that the darkness has not (nor ever will) overcome the Light. That's the verse I'm clinging to, lately.